CSMCRI Scientists Recruitment 2017- Check all the details related to CSMCRI Recruitment 2017 here. CSMCRI Scientists Recruitment 2017: Scientist, Project Assistant & Other Posts- Central Salt & Marine Chemicals Research Institute (CSMCRI) has released an employment notification for the recruitment of Senior Scientist, Scientist vacancies.Interested and Eligible candidates may apply in the prescribed format on or before 29-09-2017. Candidates upper age should be 37 years for post-Senior Scientist, 32 years for the post-Scientist as on the last date of receipt of application. Age relaxation is applicable for 05 years for SC, ST, 03 years for OBC candidates as per GOI rules. Candidates should have a Ph.D. in the stream agriculture with specialization in the Genetics and Plant Breeding with two years of post-Ph.D. research experience for post-1, Ph.D in the area of Physical Oceanography or Chemical Oceanography or Homogeneous Catalysis/ Inorganic/ Physical/ Organic chemistry/ Heterogeneous Catalysis/ Material Synthesis or ME/ M.Tech in relevant fields or equivalent for post-2, Ph. D in the area of Chemistry for Scientist, Ph.D. Chemistry with 2 years post Ph.D. experience for Senior Scientist for post-3. For more details refer the notification. Selection of the candidates will be based on test/ Interview. Candidates should have to pay Rs. 100/- drawn by pay Demand Draft in favor of the Director, CSMCRI, Bhavnagar payable at Bhavnagar. No fee will be applicable for SC, ST, PWD, women & the departmental candidates. Interested and eligible candidates can send their application form in the prescribed format along with all the relevant documents, self-addressed envelope of 11″ X 5″ size affixed with postage stamps of Rs. 10/-, in a sealed cover which is super-scribed “Application for the post of ____ post code___Advt. No. 2/2017″, a fee to the Administrative Officer, CSIR-Central Salt & Marine Chemicals Research Institute, Gijubhai Badheka Marg, Bhavnagar-364 002 (Gujarat) on or before 29-09-2017. 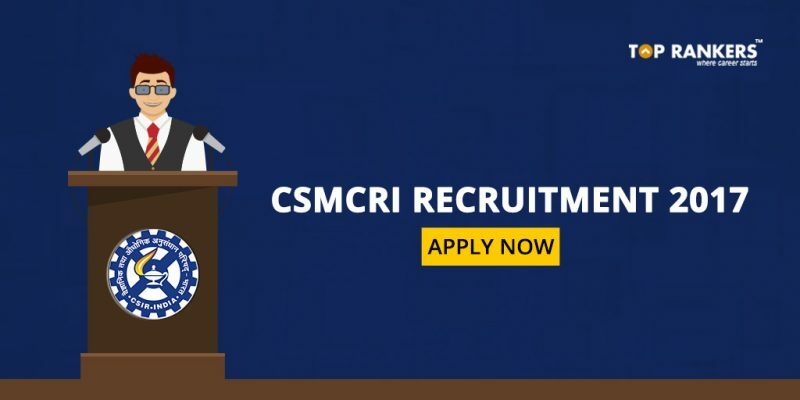 Stay tuned for more updates on CSMCRI Scientists Recruitment 2017.